With reference to The Ratings Soup (BT, October 16), CRISIL believes that price increase after the listing is not an appropriate metric to measure the efficacy of IPO grading because factors such as liquidity and market sentiment, besides the fundamentals, play an important role in determining pricing. Since IPO grading evaluates the fundamentals of a company, its efficacy should be measured by taking priceearning, or P/E, multiples and share price volatility over a longer period as indicators. Our studies show that companies with higher IPO grades command higher P/E multiples due to a superior earnings profile backed by strong management and corporate governance. Their stock prices are less volatile on account of higher earnings visibility. IPO grading is meant to aid investors in their decision making and is not a recommendation to buy, sell or hold. Since IPO grading is meant to assist novice investors in making investment decisions, we found post-listing price a better yardstick. It is something that investors can relate to. Relative P/E multiples and share price volatility are difficult for retail investors to fathom. Besides, SEBI wants investment bankers to become more accountable and provide, while filing a new prospectus, price-based performance of IPOs they managed in the past. 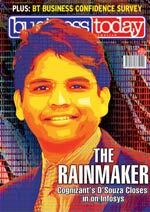 With the global economy facing the threat of a slowdown, your cover story (The Rainmaker, Oct 30) is timely for the IT industry. Hats off to Francisco D'Souza for turning the fortunes of Cognizant around. Right now, it may appear tiny compared to IBM and Accenture, but the biggies had better watch out. In Up, Up…and Down (BT, October 30), some data may have seemed confusing. Indian exports for 2010/11 were incorrectly mentioned as $246 billion. That was the government's provisional estimate. The revised estimate is $254 billion. Also, the number for Indian exports in the April-June quarter - $128 billion - ncluded services exports.